It seems like Cranky and I packed in an entire summer's worth of grilling yesterday. We are headed off for a visit with my parents, and thought it made sense to pre-cook some vittles to bring along for the ride. We figured, hey, since we're firing up the Smokey Joe, let's really make good use of those stinky charcoal briquettes (and yes, Biggles, stinky because they were doused with starter fluid, but honest, we think we got the chemical smell to burn off before we waved the first slab of protein in their direction... which is not to say that stuff didn't smell bad — at first). Now, speaking of smells. Well, wait, let me backtrack. Last month I wrote about my Strange Pickles, of which I think the most successful was the cherries soaked in sage-mint vodka, vinegar and lavender. 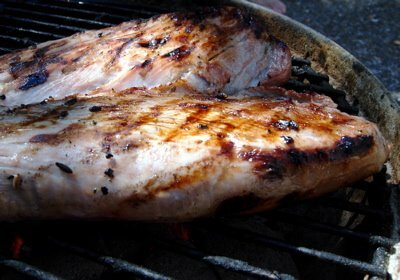 I know there were other flavors in that brine, but it wasn't until I decided to recycle a little of it as a marinade for pork tenderloins that I remembered the vanilla (because, d'oh, there were little pieces of vanilla pod drifting around the bottom of the jar). OK, so the meat bathed in the brine for two whole days, absorbing yummy flavors and waiting for Cranky and me to finally fire up Smokey Joe. Which we finally did. And when the chemical aroma finally departed from the atmosphere, the meat met the flame — and suddenly it smelled like we were in a bakery! So that's what makes cookies smell like cookies. Cooked vanilla. It was actually a nice flavor for meat, though possibly in lower doses next time. But we couldn't stop fooling with flavors there, not as long as we had other strange flavors on hand. (My relationship with food has been a tad wobbly lately. Perhaps I'm instinctively trying to jump-start things with potent sensations.) So, when the tenderloins were tender, we sliced them and served the meat with little dabs of sour plum jam. It was just jim-jam dandy. Meat cookies. As for the rest of the grilling: I am so off my game. I overcooked the sausages and tried to pull the New York steak off while it was still raw. I am so off my game. Perhaps I need a vacation. See you in a few days. Awful tamales?! I didn't know there could be such a thing. I learned the vanilla thing years ago when I started wearing vanilla scented body lotion. Everytime I did, one of the guys would come into the office and ask, "Who's eating French toast?" Sorry about the awful tamales. I have had some bad ones at times and nothing worse than a bad tamale. By the way I finally responded to your tag. Meat and sweet sounds wonderful. I love to slather red pepper jelly on chicken or steak. You still got game! I insist. You're a great writer. Just go with it, especially the confusion. It's interesting to read and not self-indulgent. And good luck with all your coping strategies. I like meat cookies! At my house we always call bbq Meat Candy! Er, UH, I was 'that' lungeon guest and I don't remember the 'males sucking that much. Plus the 2 salas Cookie & Cranky served were wonderful. This coupled with fresh heirloom maters with a cool refreshing BEER was delightful! I would come by each day to have such an awful lunch and horrible company in such a nasty sun filled, tree lined happy lunch. Sculpin: You've never had a cement lump with missing chicken? Hee hee. Greg: Yeah, but not as sweet as you'd think. Imagine vanilla without any sugar at all. Oh, it baffles your tongue in such a good way. Stacie: Yeah, I'm totally into meat candy (which for me is bacon or salame). Biggles: You come back any day. Kisses.